Above anything else, a stud finder needs to be accurate. If you can’t trust the tool you are using to prevent utter disaster, there is no point in spending a dime on it. For a successful project, you need to know what you are dealing with on the other side of the wall. The ProSensor 710 Franklin Sensors Precision takes the top spot because of the accurate and detailed look it will give you while in use. The Precision can detect a wide area of wall while searching for studs underneath. The extra width of the device means you will have a more accurate sense of stud locations as you move the finder along the surface. LED lights on the front will light up, marking the location and width of any stud so you will know exactly where the stud begins and ends as you work. For the occasional weekend home project, a budget stud finder is a great option to save money. You still need to be careful, however, since many budget options lack the accuracy you need to reliably drill into your walls. Typically, the best budget options offer the basics without the extra detection capabilities. The Zircon StudSensor e50-FFP will give you basic wood and metal stud detection at an affordable price. This finder packs a lot of handy features within its small price tag. Capable of detecting both wood and metal studs, the finder will flash and beep once it has picked up the edge of a stud. It includes two scanning modes: StudScan for studs up to 0.75" deep and DeepScan for targets around 1.5" deep. The finder also includes the ability to detect live AC wires to avoid drilling into dangerous electrical hazards. Magnetic stud finders are the old school cousins of modern, more advanced finders. Despite their simplicity, a good magnetic finder can be a great budget or additional option if you want something that will work without any batteries. Using a built-in magnet, stud finders like the CH Hanson 03040 will naturally be attracted to the nails and screws that hold the home’s frame together, giving you a good idea of where studs are behind the wall. The finder uses powerful rare earth magnets to find metal studs and fasteners without any need for power. The body of the finder also includes a two-way level so you can hang the finder from a metal stud for accurately leveling walls and other surfaces. A pointed arrow on the bottom will conveniently mark the safe spot for screws and nails, eliminating the need for trial-and-error while hanging pictures, frames and other objects onto the walls. Different materials in the floors, walls, or ceiling can present a unique challenge for stud finders. In many cases, the finder itself may only be able to detect wood studs. Plastic is especially challenging since a typical finder won’t register anything even when there is a plastic surface underneath. If you want to be sure you have something that will give you an accurate look at plastic surfaces, the DeWalt Wall Scanner is the best choice. Metal is another support material that can be difficult to detect for typical stud finders calibrated for wood studs. Even magnetic finders might not register all types of metal since many metals aren’t magnetic. The Zircon MetalliScanner M40, on the other hand, is custom designed to detect a wide variety of metal supports and objects behind floors, walls and ceilings. The MetalliScanner will detect both ferrous (magnetic) and non-ferrous metals behind most types of nonmetal walls, floors and ceilings. Beyond metal studs and other support structures, this makes the finder great for locating smaller items like screws and nails deeply embedded into the wall up to four inches deep. The blue coil changes as you move the finder to reveal the precise location of any object it detects as well. It’s important to have an accurate idea of the support behind the floors and ceilings if you have a project that requires drilling or hammering into these surfaces. Ceilings are particularly important since a nail or screw in the wrong place can bring a large chunk of drywall down onto your floor or even head. The Bosch GMS120 is a multi-scanning option that is comfortable to hold in awkward positions to reach the floor or ceiling. The ergonomic design of the finder houses a multi-mode sensor capable of detecting wood studs, metal support objects, and live AC wiring at the same time. This finder is the top choice for floors since it provides a deep 4.75" scan depth, and can handle materials as dense as cured concrete. The LCD display and audible detection signals also provide plenty of feedback for finding and noting objects underneath the floor surface. One of the most dangerous, hidden things to avoid in the walls or ceiling is live electrical wiring. Wiring to the lights, outlets and switches can kill if you are drilling or hammering into your walls with the power on. Even when the power is off, you can still avoid the headache of severing a wire with a finder that can detect the smaller profile of wiring like the Fetanten TS005. If you want to play it safe with electrical wiring, this stud finder will give you an extra peace of mind while working. The finder includes four different scanning modes for woods, metals, AC wires and deeply embedded objects. Its AC detection mode is highly accurate with a range of less than +/- 1%. The basic graphical display features arrows that change location and shape to accurately mark the presence of detected objects as you move the finder around. With only three buttons on the front, the finder is extremely easy to use right out of the box. Our reviewers spent four hours testing one of the top-rated stud finders available. We asked them to consider the most important features when using this stud finder, from its amount of surface area to its accuracy. We've outlined the key takeaways here so that you, too, know what to look for when shopping. Stud material Most homes have wooden studs, but commercial buildings may have metal studs and there are even instances when plastic studs are used. Certain stud finders are only calibrated to find one type, so take the stud material into account as you shop. 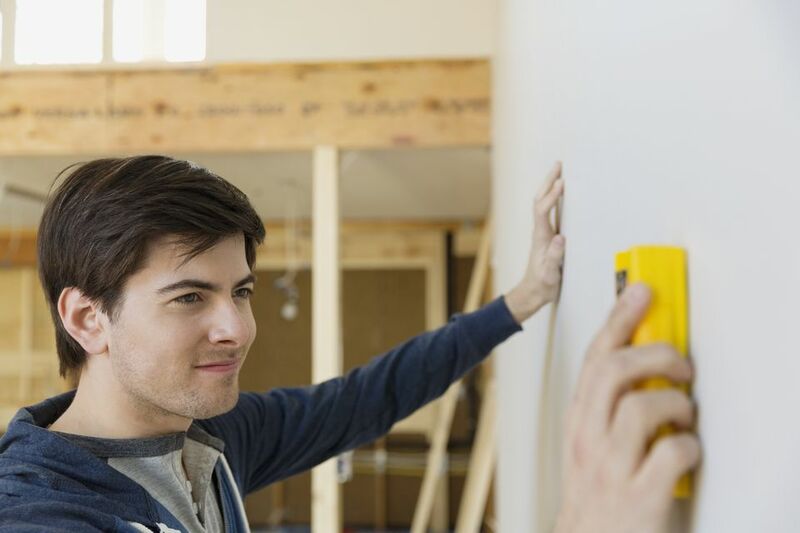 Stud location You’ll want to consider whether you’re looking for studs in a wall, ceiling, or floor — some basic stud finders might not be strong enough to penetrate a thick floor. You’ll also want to make sure that your tool has a comfortable grip that allows you to hold it at any angle. Additional features You may just want a basic tool that finds studs and nothing else. However, some high-end models have additional features that can be helpful for more complex projects. For instance, some units can detect live wires or even keep a map of the wall you’re examining — helpful information for bigger tasks.